The thing about being on a diet is that you suddenly have a voracious appetite for all the things you're not supposed to be eating. Seriously, I'd give my right arm for a cheeseburger right now! 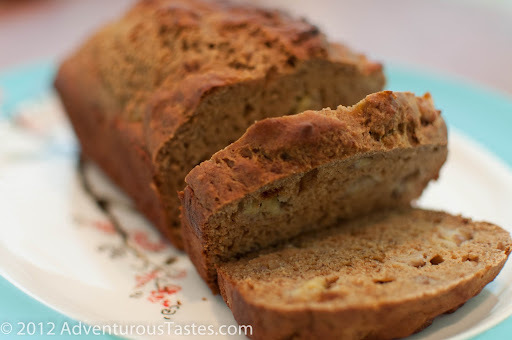 So when I was hankering for banana bread, I decided to figure out a way to make it healthy. I scoped out a bunch of online recipes, and ultimately settled on one that replaced flour with whole wheat, oil/butter with apple sauce and sugar with agave nectar. Baking off recipe makes me nervous, but this turned out great! The bread was moist and flavorful. I only had two bananas, but this would be even better with three. Next time I might try mixing some yogurt into the mix in place of apple sauce just to see what impact that has. At only 3 points a serving, you can even spread on a little butter for an extra special treat! In a separate bowl, mix together applesauce, agave nectar and vanilla. Stir in eggs and mashed bananas in with applesauce mixture until well blended. Stir banana mixture into flour mixture; stir just to moisten. Pour batter into prepared loaf pan. Bake in preheated oven for 45 minutes, until a toothpick inserted into center of the loaf comes out clean. Keep an eye on it because some recipes say as long as 65 minutes, but mine was done in 45) Let bread cool in pan for 10 minutes, then turn out onto a wire rack.